Texas charter schools: Curriculum teaches creationism. 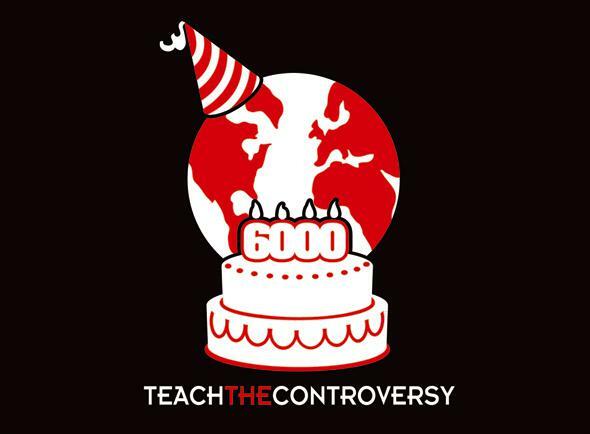 As usual, when I write about this topic, let me start off by being very clear: Young Earth creationism—the idea that God created the Earth 6,000 to 10,000 years ago, borne of a literal interpretation of the Bible—is wrong. It is provably wrong, and in fact it is a violation of the United States Constitution’s First Amendment to teach it in public school. So why is Texas (and with new schools opening, also Arkansas and Indiana) spending a whopping $82 million of taxpayers’ money every year to teach it? This revelation comes from Zack Kopplin, who wrote a devastating article here in Slate about his investigation of Responsive Education Solutions, a group of publicly supported charter schools that currently has more than 65 campuses with 17,000 students enrolled. Kopplin obtained a copy of Responsive Ed’s workbook for biology that is used throughout their charter system, and what’s inside is disturbing, to say the very least. 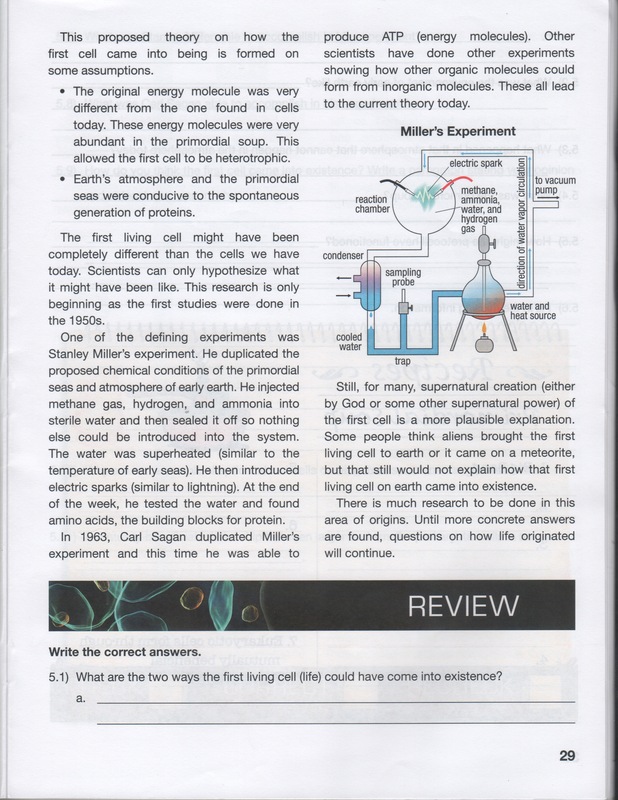 The workbook, called a “Knowledge Unit”, is loaded with creationist propaganda, both subtle and overt. A large fraction of the curriculum in it is devoted to creating doubt about evolution (and other scientific fields) and to promoting a completely false controversy about the scientific facts of biological evolution. The entire workbook has been scanned and is available online. If you want your head to explode, then by all means go read it. I did, page by page, and it is a textbook of creationist tactics. What follows are just a few examples. Over the years, the theory of evolution has been through an evolutionary struggle of its own. The original theories have been explored, modified, rejected, confirmed, or replaced with new ideas. Still the basic theory of evolution has survived in the discussion. In fact, evolution—which is, after all, an unproved theory—has been treated as fact. It has reached the level of dogma, widely accepted, but unproven and changing school of thought that is treated as though it were fact. That’s in a science text, folks. First, evolution is a fact. It has been observed directly and is actually the very basis of modern biology. It’s not just a guess or some made-up wacky idea. Also, note the “unproved theory” line: that’s a standard creationist line meant to sow doubt about evolution. It relies on the common use of the word “theory”—a guess—as opposed to how scientists use it—what most people would call a fact. And don’t even get me started about the slap-in-the-face irony of creationists saying that scientists are dogmatic about evolution. In recent years, these two schools of thought—creationism and evolution—have been at conflict in school, universities, and scientific circles. Some scientists and educators have attempted to bridge them through ideas such as intelligent design and theistic evolution. However, none of these theories is accepted by every scientist, natural philosopher, or educator. It’s fascinating to see the how they phrase all this. First, note the false equivalency being set up by calling both creationism and evolution “schools of thought.” Evolution has a deep and broad basis of support, whereas creationism is based solely on the Bible (if that’s the flavor of creationism to which you adhere, I’ll note). Also, the conflict is entirely one-sided. Sure, not every scientist accepts everything about evolution, but the vast, overwhelming majority of scientists do. The naysayers are a tiny, tiny minority, and religiously motivated. And given that we’ve seen over and over again how they deny the reality of evolution, how they twist facts, how they use loaded phrases, and how they employ deceptive practices to get creationism taught in schools, I’d state flatly that their arguments should be tossed out the nearest window. They then spend four pages—as much as they do on any of the science—promoting the false “controversy” of evolution. Those pages are loaded with misinformation, even bizarrely using a section to discuss vaccines and autism (and even getting that wrong as well; saying we don’t know if vaccines cause autism, and more research is needed. Nope: We know vaccines don’t cause autism). In other words, this workbook is an attack on science and a covert religious tract. And that’s bad news. Creationists have been trying for years to teach their particular flavor of religious fundamentalism in public schools. And time and again, it’s been ruled not just illegal, but unconstitutional. Whether it’s straight up creationism, or its poorly disguised cousin intelligent design, judges have shown that teaching it with public taxpayer funds violated the First Amendment. In the famous Dover case, this ruling was brought by a conservative judge, so it’s hardly a liberal conspiracy, either. It’s just a fact. Trying to teach a religion as truth in a public school is illegal. So how does Responsive Education Solutions get away with it? They have what Kopplin calls a “secular veneer”—what looks like a nonreligious coating on their writing, but even a cursory glance at the workbook shows it for what it truly is. And perhaps doing this through charter schools makes it somewhat easier than if it were in the public schools. Louisiana has been doing something similar, by using public funding to create vouchers to get kids out of public schools and into private schools where creationism is taught. This action is illegal, but is endorsed by Louisana’s governor, Bobby Jindal. Responsive Education’s CEO, Chuck Cook, has responded to Kopplin’s article in Slate, but as you’d expect what he says is just as bad as what’s written in the workbook. The Texas Freedom Network takes down his response, as does the Arkansas Times. Oh, and it should be noted that on top of being unconstitutional and hugely draining on taxpayer money, Responsive Ed’s system had “less favorable” results than other charter schools as determined by Stanford’s Center for Research on Education Outcomes. Needless to say, Responsive Ed had problems with that, and also needless to say, CREDO showed that response to be somewhat lacking as well. So what can be done about this? Well, for one, spread the word. The more people who know about this, the better. Also, I want to put in a plug for Kopplin. This outstanding young man has been fighting the forces of anti-science for years and has done an astonishing job shining the light of reality on what they’re doing. His advocacy group, Second Giant Leap, wants to increase funding for science education, putting it on par with the efforts of the Apollo program. I think this is a fine idea, as is his effort to stop Louisiana from teaching creationism in its schools as well. Also, if you live in Texas, Arkansas, or Indiana, talk to your local representatives (and your state ones as well). They’re easy enough to find online, so send them a note (physical U.S. mail is even better) letting them know what you think about this. Be polite, but be firm. You can also get involved in your local school board, where a lot of the decisions to use various curricula are made. In this country, we have freedom from religion just as much as we have freedom of religion. The latter depends on the former. No matter what people tell you, we are not a Christian nation, we are a secular one, and the country’s founding document, the Constitution, was specifically drafted to make sure it stays that way. But that depends on us. Get vocal, and get active. Protect our Constitution, and protect the science education of an entire generation of Americans.